Which Dog Breed has the Highest Prevalence and Severity of Injuries in Recent Level 1 Trauma Center Medical Studies? DogsBite.org - Last October, we issued a special report about retrospective level 1 trauma center dog bite studies published in medical science journals since 2009. 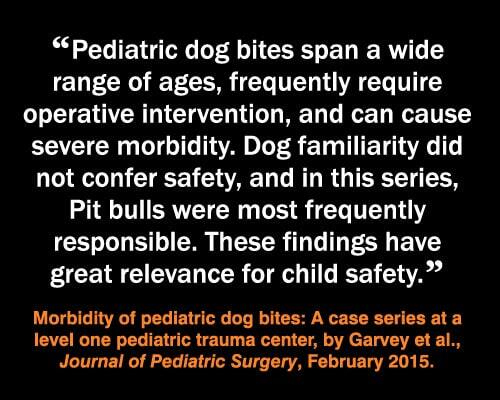 Of the 11 multi-year studies, 10 showed a higher prevalence of pit bull injuries than other breeds of dogs. All major geographical regions in the U.S. were represented in these findings. 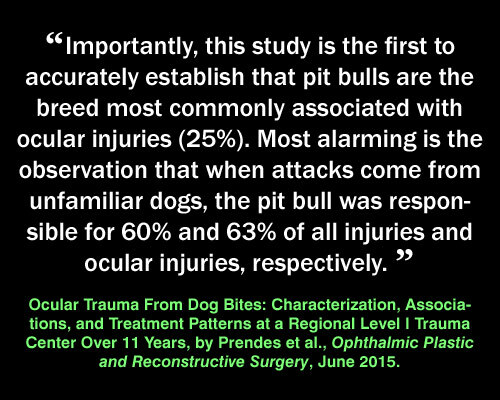 Since 2011, the majority of these studies show a higher severity of injuries inflicted by pit bulls in comparison to other dog breeds as well. 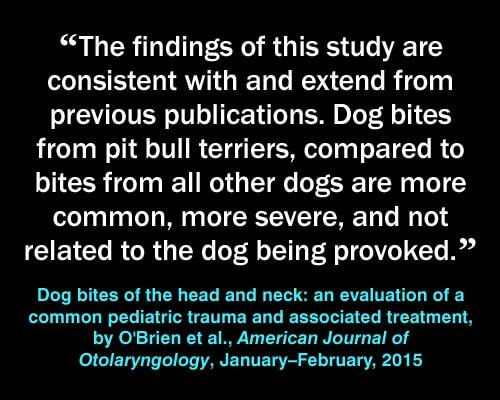 We developed a meme series highlighting these findings since 2011 to empower dog bite victims' advocates and to remind journalists there is a growing body of medical studies in this area. 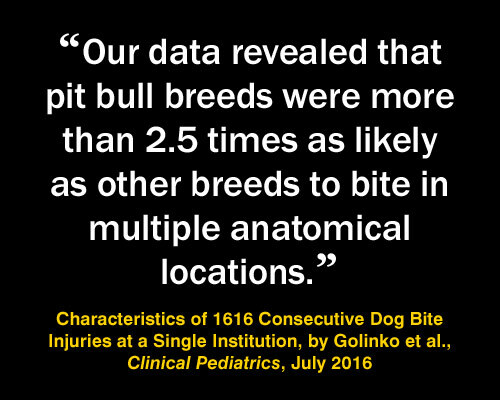 The most recent, Characteristics of 1616 Consecutive Dog Bite Injuries (July 2016), refers back to eight different studies; their findings are consistent with six of them regarding pit bull injuries compared to other breeds of dogs: a higher frequency of injury and a higher severity of injury. We encourage the public and members of the media to review our special report and the related level 1 trauma studies table, which spells out the study years involved, the level 1 trauma centers, the geographical regions represented and the medical science journals that published them. Currently, there is no national surveillance system for capturing breed data at level 1 trauma centers, but as evident by these studies, multiple trauma centers are already collecting this data. 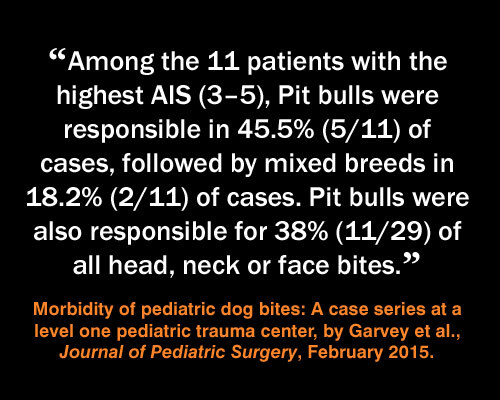 In the Seattle regional level 1 trauma center, researchers were able to obtain breed information in 79% of the cases. 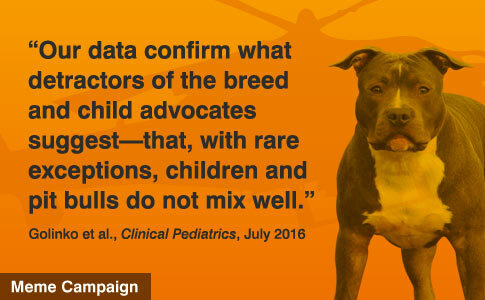 In the Phoenix pediatric trauma center, they obtained breed information in 75% of the cases. Our meme series starts with the most recent study (Golinko et al.) published in July 2016, and ends with the 2011 study (Bini et al. ), whose results were confirmed by Golinko. "Although other breeds may bite with the same or higher frequency, the injury that a pit bull inflicts per bite is often more severe. Consistent with these findings is that of Bini et al.," states Golinko. 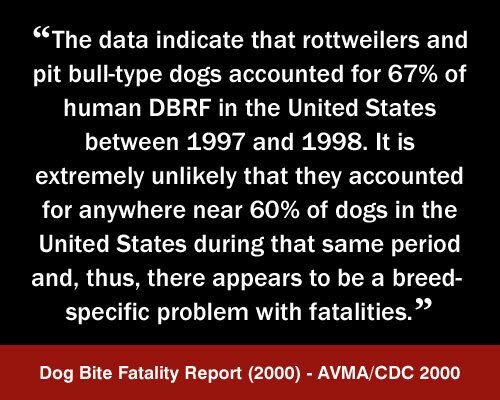 The last two memes show the disproportionate death rate inflicted by pit bulls and rottweilers since the 1990s. 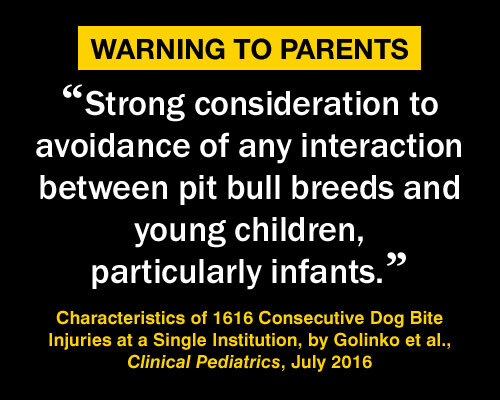 The last two memes remind readers of the CDC's findings 17-years ago, "there appears to be a breed-specific problem with fatalities," regarding pit bulls and rottweilers. 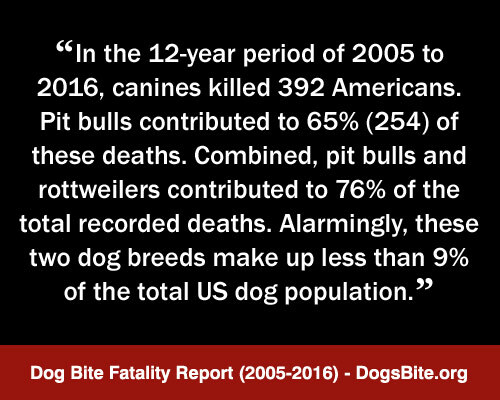 The disproportionate killing by these breeds has only increased since. 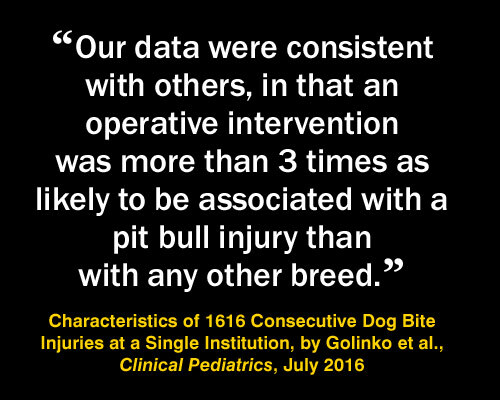 Back then, the CDC implored researchers to study the increasing problem of "nonfatal" dog bite injuries requiring ED visits or hospitalizations. 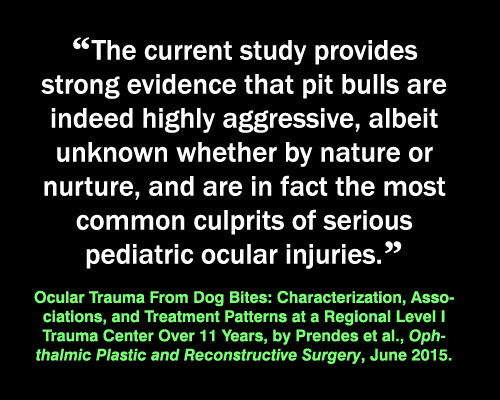 Researchers have now done so, confirming that pit bulls are a focal point in this area as well. Download and share these memes on social media. These memes can easily be shared from our related Facebook photo album as well. Sharing these memes could save a child's life or limbs! 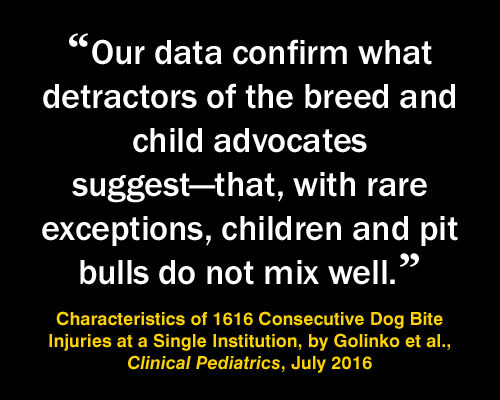 Open Access Characteristics of 1616 Consecutive Dog Bite Injuries at a Single Institution, by Michael S. Golinko, MD, MA, Brian Arslanian, MD, and Joseph K. Williams, MD, FAAP, Clinical Pediatrics, July 2016 (View related graphic). 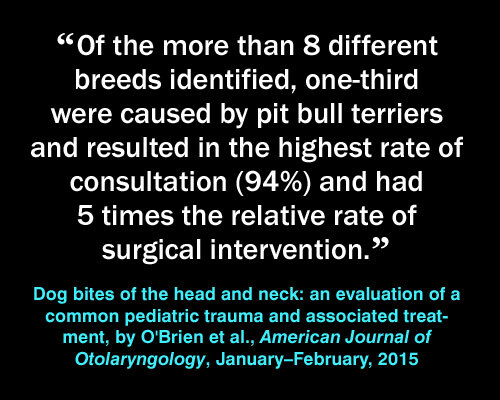 Open Access Dog bites of the head and neck: an evaluation of a common pediatric trauma and associated treatment, by Daniel C. O'Brien, BS, Tyler B. Andre, MD, Aaron D. Robinson, MD, Lane D. Squires, MD and Travis T. Tollefson, MD, MPH, American Journal of Otolaryngology, January–February, 2015. 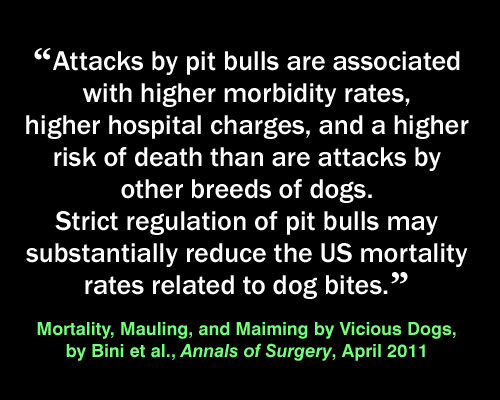 Mortality, Mauling, and Maiming by Vicious Dogs, by John K. Bini, MD, Stephen M. Cohn, MD, Shirley M. Acosta, RN, Marilyn J. McFarland, RN, MS, Mark T. Muir, MD and Joel E. Michalek, PhD; for the TRISAT Clinical Trials Group, Annals of Surgery, April 2011 - Volume 253 - Issue 4 - p 791–797 (View related post). 12-Year U.S. Dog Bite Fatality Chart - 2005 to 2016, by DogsBite.org, February 14, 2017. See the extensive discussion notes, which compares trends between modern fatal dog attack statistics and years studied by the CDC. Breeds of Dogs Involved in Fatal Human Attacks in the United States Between 1979 and 1998, by Sacks et al., Journal of the American Veterinary Medical Association, September 15, 2000, Vol. 217, No. 6, Pages 836-840.